A few different types of lights are used such as track lighting, recess, and direct lighting. 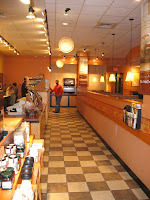 Track lighting is used to highlight sales areas, such as the cafe and bakery menus. Recess lights are used to brighten pathways and direct people through this space. 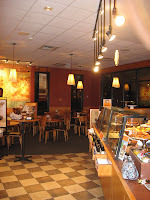 Direct lighting is used in the seating areas. Creating a subtle glow over each table. Each type of light contrasts in brightness. This creates a gradient from bright to dim within this space. I feel the lighting used in Panera is very successful.